1# Hormel Less Salt Chili with Beans: My choice for a quick breakfast. 2# Wolf Brand Chili No Beans: My choice for recipes that calls for spicy sauce. 4# Skyline Original Chili Recipe: My choice to mix with my pasta. 5# Nalley Chili Con Carne with Beans: My choice when I crave for home cooking. Choosing your canned chili is not that difficult at all. If you are that curious and determined to start eating spicy recipes, you need to know what to consider when buying one. Here are some facts you need to know when picking the right one for you. For variations, there are different types of canned chili that you can choose from in the supermarket. Depending on how you like your food to be, one of these types if not all could land as a regular in your kitchen. The traditional spicy stew never fades when it comes to taste. This classic spicy sauce consists of chili peppers, tomatoes, beans, and meat. You may find that the usual seasoning for this blend is onions, garlic, and cumin. 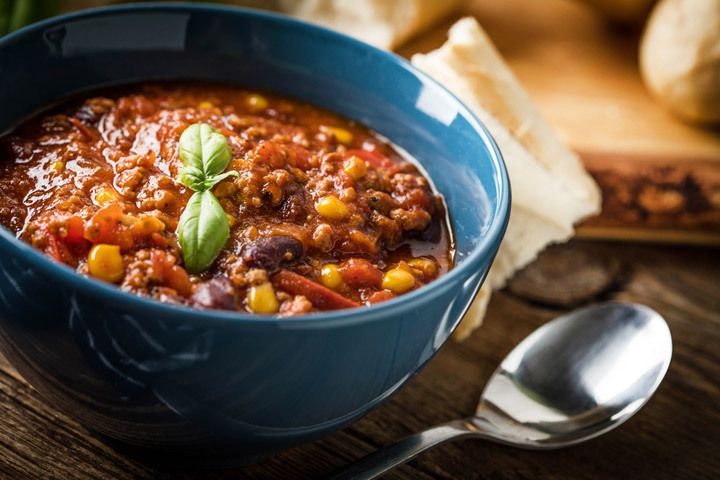 Because of the diverse cooking culture each cumincountry has, using chili con carne may be a basic dish for one or merely an ingredient for some. The seasonings may also change depending on the different taste preference. However, no matter what, using canned chili saves up time in preparing meals. This canned green chili could be super spicy or mild sauce or stew. It contains roasted green chili, tomatillos, garlic, and bits of cooked pork in chicken soup. You may find some products with tomatoes, but mostly it does not have. If you are fond of burritos, then you have been eating Chili Verde all the while. Are you surprised to know about white chili? It’s just called white chili because the dish color turns out white after cooking. Canned white chili contains bits of roasted chicken breasts or turkey meat, white beans and cream sauce instead of beef and tomato sauce. If you have problems of hyperacidity or cannot tolerate spiciness, and you want your chili dish to be mild, choose this type of canned chili. I like the idea of mixing other vegetables inside the canned chili. It makes the blend more flavorful and healthy. Check the labels of the can and choose those that have the vegetables that you like. 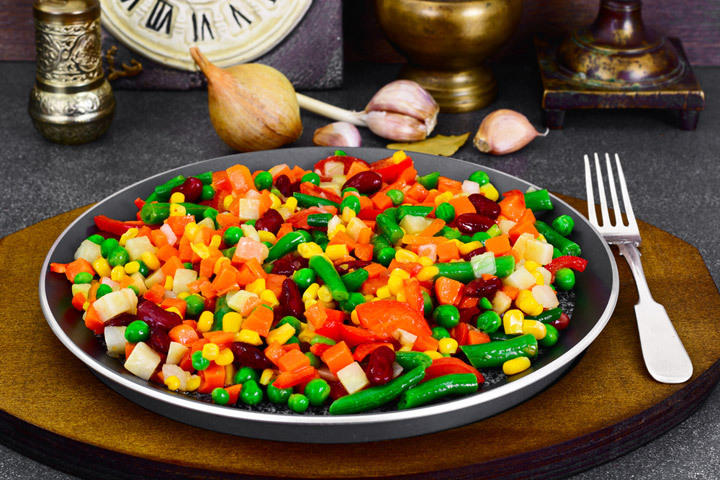 Some likes it to be pure chili, but others also love the chili-veggie mixture. Therefore, manufacturers made a variety of it particularly beans and tomato to suit the taste of consumers. Vegetarians out there must be happy to know that there are products that don’t have meat and contains purely chili and vegetables. Because of some meat substitutes (beets, squash, mushrooms), it simply tastes like real meat. For meat lovers like me, plenty of canned chili with meat is available that you can buy. You can choose between beef, pork, chicken, or turkey. You can choose between cubed or ground, chunky, creamy, and tender type of meats. I know that many differ in preference so you can mix your own seasonings, vegetables, and kind of meat in accordance to your liking. What is your tolerance when it comes to spicy food? Do you know that it’s even a challenge nowadays? Check the label of the canned chili, and you’ll see that the level of spiciness is indicated. Choose whether you like medium, medium-hot, hot, and super hot. The spiciness of the canned chili is dependent on the kind of chili used to make it. Some like it mild, but for the extremes, they want it super spicy. Every brand has their own signature blend. Therefore, the thickness may differ. This is helpful when you want to cook several recipes that require different thickness. I commonly use the beef patty, tomato paste, and stew-like thickness. 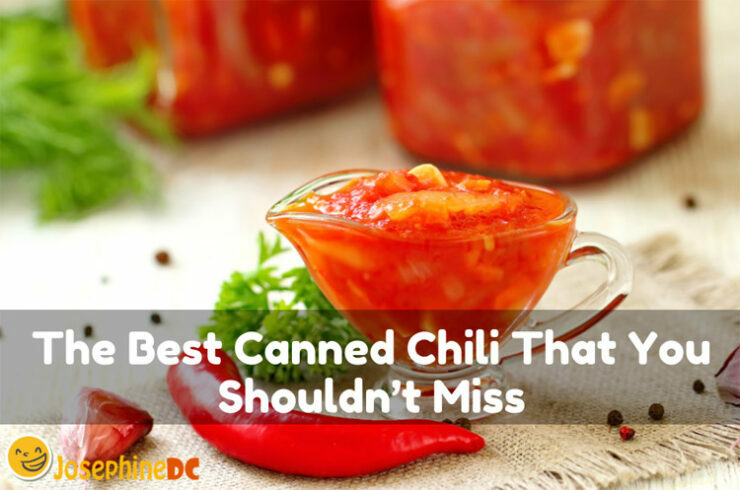 The canned chili products in the top list are winners based on customer reviews, actual sales, and some personal testimonies. I came up with the best canned chili to help you choose the right kind. The products are made by trusted manufacturers and gained the most positive reviews based on quality and cost. If you like your canned chili with beans, then this is your pick. Although some express their disagreement with beans mixed with chili, there’s no denying that this combination tastes superb. Hormel made this mixture with 25% less sodium compared to regular canned chili without beans. It has rich flavors of tender beef, tomato paste, and spices for the genuine chili taste. As a perfect source of protein (16 grams), this product is excellent for chili sliders, bowls, and dips. Besides, there are no artificial ingredient, no preservatives added in the blend, and can coating do not contain BPA. This is the best alternative when you don’t have time to make chili sauce from scratch. For those that are always on the go, a quick and easy meal preparation is convenient. Can has a pull-up design for safety and convenience. Low-fat level compared to others. You can taste the real meat. The wolf brand made this “no beans” chili for those who want it simple like the old times. If you have problems with consuming beans, this product is your choice. This is also perfect to blend in with other ingredients that you have in mind. Do you know what this canned chili is best for? It’s an excellent sauce for breakfast Mexican recipe Chilaquiles. This is a bit higher in price than other kinds but it’s worth it. Take note though that this also contains soy. If you can’t tolerate soy, this is not recommendable for you. Has the right amount of spices. This spicy Mexican organic chili with medium beans and vegetables makes the canned chili a favorite pick for those who love strong taste of spice blended with sweetness. A 590 g can of chili contains 25% sodium, 30% of vitamin A and 15% of vitamin C, 4% calcium and 10% of iron. The product does not use eggs, fish, and peanuts. Hence, it does not impose a high risk for allergy-prone consumers. It’s guaranteed that Amy’s Kitchen ingredients are grown without the use of harmful chemicals and GMO’s. Being a good source of protein and fiber, this canned chili that is not too hot and spicy tastes best with rice and meat. Not bad for a family business that promotes organic and healthy food. A shout out to all vegans out there, this canned chili is for you! Taste is a bit bland. I’ll let you be the judge of this one. I trust that you love the traditional taste of chili sauce which contains carefully picked ingredients. It’s neither salty nor bland for my taste, but it sure has a thick and spicy tang on it. I invented my own “Chili spaghetti” with this canned chili and found out that sprinkling parmesan or cheddar on top of the pasta makes the taste incredible and amazing. I tell you, it’s perfect for your tortilla dips shared with everyone after the party. In each can, it’s packed with a bit of calcium, iron, Vitamin A and C, protein, and sodium. However, considering the reasonable price and the superb taste, I opt to choose this whenever I run out of my favorite chili blend. I recommend that you stock this in your pantry since it comes in handy for quick bites. Honestly, I grab this one first when I do the grocery. I love the taste of the well-cooked beans, tender and soft along with its chili sauce. A can of this chili offers high fiber with a minimum fat level in every serving. Not bad for health-conscious chili fanatics. Do you know why I stick to this product? It reminds me of the homemade taste of my grandma’s chili with beans. Yeah, it’s not just the nutrition, but the familiar flavor of it as well. Let me share with you a secret; Add a bit of your favorite Tabasco, and it will give you the kicks! The sauce is a bit thinner. What can I say? The top five on my list are the best canned chili for me. I already noted the reasons above why each of them is the best for me. Remember, for the categories that I indicated, they are the best than the other products on the market. When I feel homesick, I grab the Nalley Chili. Skyline chili is perfect for my spaghetti, and if I’m motivated to eat healthily, Amy’s organic suits best. For the adventurous me, it’s a challenge to eat Wolf’s spicy chili with friends and bring along Hormel’s Chili for a quick breakfast at work. See? They all are the best! What’s about you? What is your best pick? See also : Best Oyster Sauce: Top 10 of the Finest Brands 2019 , Best Canned Sardines that are Too Good not to Try 2019 , What Chili Paste Substitute that is Easy to Find?